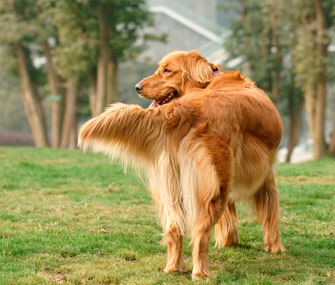 A wagging tail usually means a dog wants to interact, but it isn't always a friendly gesture. Your dog uses his entire body, from his ears to his tail, to communicate with you. He can tell you both when he’s happy and relaxed and when he’s nervous or afraid. It is important that you learn to recognize the subtle signals of fear or anxiety, particularly in a situation that might escalate into aggression. Once you know what to look for, you’ll soon realize that your dog is speaking to you all the time. There are three key areas of your dog’s body to watch: his tail, his ears and his face. A wagging tail is widely assumed to be a sign of a happy pup. In reality, a wagging tail most often signals a willingness to interact — but the engagement may not be friendly. In some situations, a wagging tail may be the canine version of a friendly wave, while at other times, it may signal an overly aroused dog about to react. So how do you know if your dog’s wag is friendly or frightened? A happy tail wag tends to have a wide, sweeping motion, sometimes with loose circling movements of the tail. Your dog will hold his tail at a comfortable height, more or less even with his back. He may hold his tail slightly higher when he is interested in something, like a treat or toy you are holding in your hand. Pay careful attention to the circumstances: When your dog is holding his tail high and erect, he is most likely intensely focused on something and ready to react to it. This can mean he’s preparing to chase a squirrel or getting ready to respond aggressively to a person. If your dog holds his tail down low, it could mean that he’s relaxed — or that he is feeling uncertain or fearful. A fast-wagging, low-hanging tail is frequently a sign of submissive behavior. A tightly tucked tail pressed to the body or under the belly can be a sign of an especially fearful animal. A dog who is feeling uncertain or nervous may exhibit a very slight tail wag that ticks back and forth at a slow or slightly irregular pace. Not all dogs hold their tails at the same height, so it’s important to recognize what’s normal for your dog. Certain breeds, like Shar Peis and Pugs, have a curly tail that naturally stands high. But even canines with very short or curly tails can use their tails to communicate — it’s just a matter of learning what to look for. A relaxed dog typically holds his ears forward and slightly to the side. His ears may twitch when he is listening to interesting sounds. When he is interested in something, his ears will usually be forward-facing and erect. He may lower his ears and move them back during certain interactions, like accepting a treat or giving kisses. This is a normal, friendly gesture. When your dog holds his ears taut and tightly forward, it can be an indication that he is preparing to react to something. He may be getting ready to chase a cat or squirrel — or he may be preparing to lunge at a person or another dog. Your dog may move his ears back or flatten them against his head when he is feeling submissive, anxious or afraid. The more fearful the dog is, the farther back his ears may move. Ears that are held tightly pressed back signal a canine in a defensive position. A dog holding his ears in this way may aggress to protect himself. It may be harder to see this in floppy-eared dogs like Cavaliers or Cocker Spaniels; for these breeds, watch the base of the ear rather than the ear itself for any backward shifts.